To unlock a door, push the door lock button(1) to the “Unlock” position. The red mark (2) on the button will be visible. To lock a door, push the door lock button(1) to the “Lock” position. If the door is locked properly, the red mark (2) on the button will not be visible. The front door cannot be locked if the ignition key is in the ignition switch and the door is open. The door cannot be locked if the smart key is in the vehicle and any door is open. 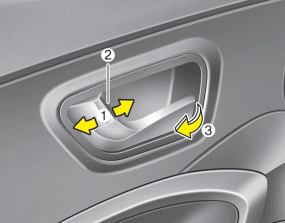 When pushing down the lock switch (1), all vehicle doors will lock. 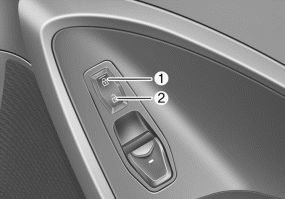 When pushing down the lock release switch (2), all vehicle doors will unlock. 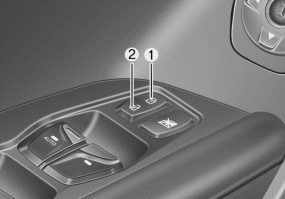 If the key is in the ignition switch and front door is open, the doors will not lock even though the central door lock switch (1) is pressed. If the smart key is in the vehicle and any door is open, the doors will not lock even though the central door lock switch (1) is pressed.